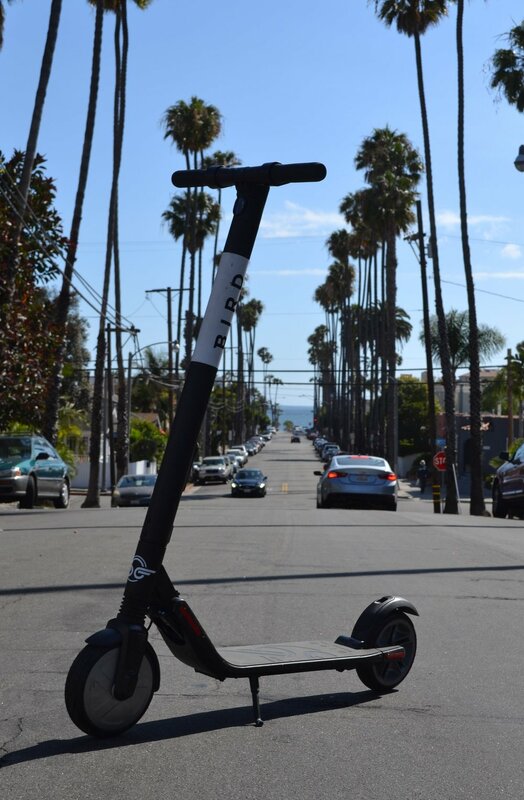 Bird electric scooters are a relatively new public transportation craze found all over Santa Monica and Venice. The concept is simple, a rental scooter that can be picked up or parked anywhere using their app. Since their release in mid 2017, they’ve been a huge success and provided a practical transportation solution for both locals and tourists. Scoot over Breeze bikes, there’s a new sheriff in town. Bird has two different scooter models. The general consensus among regular riders is that the first generation is better than the second generation, it has more pickup, better brakes and a sturdier frame. There are however a couple welcomed features on the second generation scooters, notably the speedometer, limited downhill speed and improved cornering from the suspension. The scooters both cost the same to ride, 1$ to activate and roughly 7$ per hour to use. They are one size fits all and can be temporarily locked so riders can step away from their scooter without losing it. The app is well made, simple to use and convenient. The biggest inconvenience for riders is that sometimes scooters can be hard to find. second generation bird scooter, identifiable by the front suspension. From the moment they mysteriously showed up in the streets of Santa Monica, they’ve continued to gained popularity. It’s hard to go more then a few hundred feet without seeing a Bird. While they don’t own the scooter/bike-share market, it’s obvious that the popularity has left a huge impression on the west side. Still, there are many problems that need to be addressed in order for bird to continue their success. The city has had several issues with the company and the people riding them. Parking the scooters has been a big issue from the start since the city doesn’t want them blocking streets or sidewalks. This problem is being fixed by a new feature forcing users to snap a picture of their scooter parked in a safe location. Not having designated parking areas is one of the iconic features, but making hubs would mitigate this problem and appease many locals. Unfortunately they would probably lose a lot of business by doing this and become significantly less convenient. Another major issue stems from the users who are not legally allowed to ride motorized scooters. Rider need to 18 and have a drivers licence in order to ride them. At the beach it’s obvious that whatever preventative steps Bird has taken didn’t work because there are many children that still ride them. The city has also taken measures to prevent dangerous riding as police have begun pulling riders over for riding on side walks. Bird has left a huge impact on the west side and caused other similar companies, like Lime, to move their own scooters in. Despite the issues that loom over the scooter use, it's clear they’re not going anywhere. They’re practical and hopefully getting some of the traffic off the road. 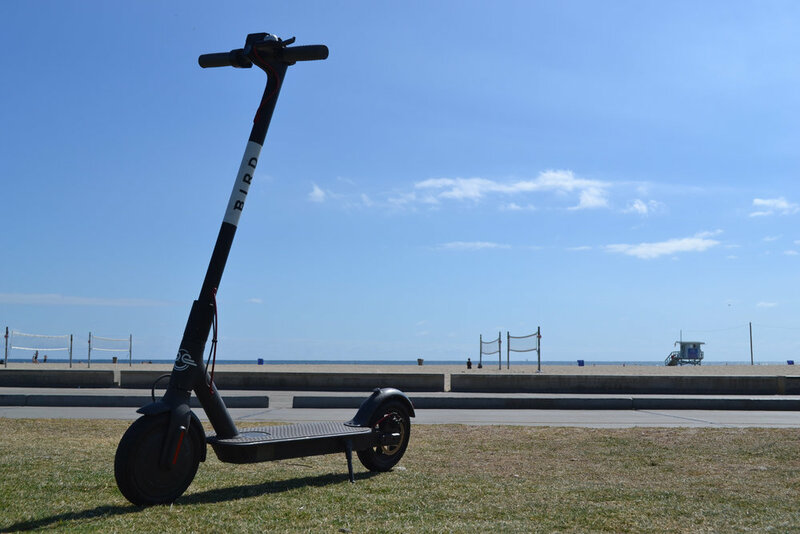 So long as Bird continues to improve their app and comply with the city and users the scooters will remain a great alternative to driving on the west side. Breeze bikes are the leading Santa Monica bike share. They are commonly called ‘Hulu bikes’ because the lime green bikes sport the web streamers logo. They’re all over Santa Monica and have a lot to offer for both locals and tourists. Breeze kicked off the Bike share culture in West Los Angeles and has been providing their services since 2015. A Breeze bike hub on the world famous beaches of Santa Monica. As an avid cyclist who's been using them for over a year, I’ve got mixed feelings about Breeze bikes. They leave a lot to be desired but are still the most convenient bike share in Santa Monica. They operate using Social Bike software and CycleHop bicycles. After a year of riding, I find breeze bikes borderline dangerous and the quality of the bikes continue to get worse with use. The chain is the big issue holding these back, well actually the belt since they don't use a chain. Perhaps this was initially done for safety reasons, but as a regular user it’s difficult to ignore the rapidly deteriorating quality of the ride. Another downside to the breeze bikes is the price. At 7$ per hour the ride quality should be better. There are many bike shares around the world that cost a fraction of the price and offer better ride quality with more features; unfortunately they aren’t in LA yet. The $2 fee when parked away from a hub makes them inconvenient for short commutes anywhere that doesn’t have a hub. Although the belt system is frustrating and the cost is steep, Breeze deserves some credit since they’ve begun rolling out new bikes that have more sturdy belts. Clearly they have noticed the deteriorating quality of their bikes. Whether or not the new belts stay intact will be revealed in time. Despite the many issues, I still find myself regularly using the bikes because of convenience. They’re sized well and fit most people between 5'0" to 6'5" (1.5m to 1.95m). I love that account holders can use a pin code to unlock the bikes, eliminating the need for the magnetic card system that most bike shares use. Additionally the bikes are very sturdy and the seats are comfortable. Breeze bikes leave a lot to be desired but are still convenient and have a lot of upside. They need to step their game up because competitors like Bird (electric scooters) are streamlining their service and may leave the bikes in the dust. Breeze needs to continue adding hubs, or get rid of them all together, and replace the old bikes if they want to compete with the new bike and scooter shares taking over Santa Monica. The Public Bikes of Taiwan, Pure Convenience! I knew giant bicycles were based in Taiwan, but I never could have imagined how integral biking is to Taipei culture. It’s so ingrained that I shed a tear after my first ride using a local bike-share. There are two bike shares in the city but this post will only cover the state sponsored bike-share, YouBike. A Youbike parked on a bike overpass next to Tamsui River. Firstly, a little background information about YouBike. They’re sponsored by the state and can be found all over the country, some people have even managed to bike around the island using only these bikes. The bikes are made by Giant and are very nice compared to the bikes of other bike-share programs I’ve used. The docking stations are easily found and are almost always full of parked bikes and parking spots, some stations can hold close to 50 bikes. Compared to the rest of the already cheap public transportation in Taipei, the bikes are by far the cheapest. A 30 minute ride costs about $0.15 USD, while an equivalent metro ride would cost upwards of $0.50 USD. Paying for the bikes is easy but does require a phone number for the initial activation. Once your account is activated you pay by tapping a magnetic Easycard the same way you would to board a bus or train. The thing that separates Taiwan’s public bike share from the rest is the quality of ride. Sure the bikes are a bit small for my 6’3” frame, but besides that it’s hard to find faults. I only encountered a few bikes with chains that slipped, bad gears or even flat tires. The bikes are relatively light in comparison to other bike shares in part because the locking mechanism is so simple. One of my favorite parts is the built in lock + key that allows users to visit a store or market without needing to dock the bike at a station. Taiwan bike share culture is very good in part because the city is so conveniently laid out for bikers. It’s common to see parents riding with one or two kids on board so cars and mopeds are vigilant and cautious of bikers. It also helps that most streets have bike lanes independent from the road. One of my favorite things about the bike share is that people leave the seats of broken bikes backwards, a simple but practical solution. Despite all these great characteristics, YouBike still suffers from a number of issues. The main one being that it is very inaccessible to anybody without access to a phone number in Taiwan because they can’t easily sign up for the program. The other big issue is that stations can sometimes be hard to find, even in big cities like Taiwan. The biggest problem of all however is the rain, and nothing can be done to fix this issue because of Taiwan's climate. I recommend the Taiwan bike share, Youbike, to anyone as a practical way to either commute or joy ride in Taipei. For more seasoned bikers looking to leave Taipei or other big cities, I recommend using a road, mountain or cyclo-cross bike. Taiwan is full of tall mountains and dramatic scenery that would better be appreciated with an advanced bicycle capable of handling the harsh conditions and terrain. For the rest of us, YouBike is a great way to commute in Taiwan. The 6b hosted an event 'St Denis Plage' on Saturday. It was a good time and had a friendly crowd that soaked up the beautiful weather but more importantly the good music. There was cheap food and drinks but I'm gonna focus the music and atmosphere. There were two stages, one for DJ's and one for live music. I spent most of the day at the live sets but from what I heard, the DJ's were pretty good and I liked the music they were playing. Before the music there was a short circus act which provided a fun story and a few exciting acrobatics. Although I was there for the music so let's move onto the good stuff. Midnights ravers were the first group to play after the short circus performance. They were high energy and got the crowd going but it was very early (and hot) when they performed so people were more timid. There were also a lot of kids running around and the whole event had a familial atmosphere at this point. The second live performer was La Dame Blanche, a Cuban musician who toked her cigar and belted some sweet Cuban tunes. She had the crowd going and was high energy as she shouted out dancing spectators and rapped her upbeat songs. At this point many of the kids had left and a more mature crowd was starting to form. There was a lot of dancing and singing along. In general the atmosphere was great and there were smiles all around. The last group was special, CongopunQ is a duo consisting of a musician and performer. The two partnered to create a high energy, interesting, interactive and exciting show. From the start the crowd was on edge after they threw a huge jug of red water onto unsuspecting spectators. The performance was just as important as the music and the crowd ate it up. The performer built weird contraptions and paraded around the crowd, tied whole groups of dancing people together and acted in general like a lunatic. On a mission of madness. What a show! This is the kind of group that needs to be seen live, otherwise their work can't be fully appreciated. In all, the event was a good time and I would recommend the next 'St Denis Plage' to anyone who likes live music or even art. Here we are at episode two of the Comey Saga and it continues to live up to the hype. Trump and Comey have been going at it for weeks and we're just starting to scratch the surface of the real story. The first clear takeaway is that Comey doesn't like Trump. The second obvious fact is that John McCain should probably check into a retirement home somewhere in Arizona where he can watch Diamondbacks baseball games without interfering with the current political rodeo show. The last obvious thing to be taken from yesterday's hearing with the former FBI director is that the public has no clue what the heck is going on. Luckily, we can speculate all we want. Comey's seven page discourse about his relationship with Trump left the committee with lots of juicy information, republicans capitalized and the democrats squandered another chance at showing any grit. Many of Comey's arguments are based on speculation due to the context of his exchanges with Trump, republicans drove that idea home. For example, Comey felt that Trump was pressuring him to end the Russia investigation but this again is based on context, he admitted that Trump only recommended he end the investigation and it was never a formal order. He even admitted that he should have been more courageous when facing Trump. Other arguments are based on unwritten rules. Comey lead the FBI under the impression that they needed to keep their distance from the White House. In one case Comey mentioned that he only spoke to Obama a couple times during his presidency, he's already spoken more to Trump in the infancy of the presidency. It's a war of words and Comey needs to speak carefully because the Republicans are prepared to feast on any little mistake. On the other had, democrats are a step behind right now. Senator Marco Rubio, a Florida Republican, had a particularly strong showing and picked apart Comey's statements enough that even the most liberal listeners knew he was getting toasted. In contrast democrats had weak showings and missed a huge opportunity. In addition, the closest to a non partisan Republican, John McCain who openly speaks against Trump, embarrassed himself with his lack of preparation. This hearing represented a huge opportunity democrats that was mostly wasted, fortunately there will be a private hearing in the near future that they'll be able to redeem themselves with. Regardless, this hearing probably will have little impact because the republicans have the house and the senate. So long as Trump still has the support of the majority party it will be very difficult to get any momentum against him. Should the FBI actually find any evidence of illegal activity it will most likely be after the fact and will take a lot of time for the political machine to process. For the third year in a row Lebron’s Cavs face Steph’s Warriors. Both teams are full of new additions that should spice up the series. Notably we get to watch Kevin Durant, an offseason addition to Golden State, play in his second finals. Durant’s last being when he played for the Thunder and lost to Lebron’s Heat. This should be an exciting series, expect lots of drama and action. This year the Cavs boast their deepest bench yet. The additions of Kyle Korver and Deron Williams add another three point specialist and backup point guard respectively, both are veterans looking for their first championship. While the loss of Dellavadova in free agency hurts the Cavs defense a bit, look for guys like Iman Shumpert and J.R. Smith to step up defensively. Since the start of the playoffs, the Cavs defense has looked strong in contrast to their lack luster regular season. Expect for these games to be high scoring until the fourth when everyone is tired and it turns into half court basketball with lots of isolation play. In terms of star power the Warriors have a clear advantage, although Lebron is still the baddest dude in the league and needs to be respected. The addition of Kevin Durant gives the Warriors another elite defender who can guard any position on the court, the other being Draymond Green. Two other off-season additions, JaVale McGee and Zaza Pachulia, have been instrumental to the Warriors. While the Warriors lost Harrison Barnes, Andrew Bogut and Mo Speights, their new roster is a clear upgrade in terms of star power but lacks depth compared to previous years. Pundits berated the Cavaliers defense for their second half performance when they gave up 109.6 OPP PPG (opponent points per game), good for 23rd overall. Their defense was bad all year and it's the reason they ended up second seed. Coach Lue mentioned that he didn't want to give away any secrets on defense before the playoffs and he may have been onto something. The Cavs have improved their defense dramatically since the start of the playoffs, they sit at sixth with 103.2 OPP PTS. Still not great but its a clear improvement over their regular season statistics. Like the Cavs, the Warriors didn't have an elite defensive team during the regular season. Despite an NBA best +/- rating of +11.6, their OPP PPG ranked 11th with 105.4 OPP PPG. This is probably due to the team adjusting to the addition of Durant since their second half OPP PPG was 3.6 points lower than the first half. The playoffs have been a totally different story; the Warriors are undefeated and have a +/- of +16. Absolutely absurd considering most people think the western conference is stronger. Although it's important to know the Warriors opponents struggled with injury problems all playoffs. The Warriors have improved their playoff defense and are giving up only 102 OPP PPG, so they have a slight edge over Cleveland. The finals are going to be dictated by defense, they always are. The past few years have been dominated by small ball and heavy use of shorter lineups that run fast paced trigger happy offenses, none better than the Warriors. Of course guard play will be important in winning, but the roll of the big men has been greatly overlooked. The Warriors are going to need to get everything out of Pachulia, Green and McGee who need to rebound efficiently and contain the elite rebounding duo of Thompson and Love. This is going to be a physical series and expect for Zaza to make some questionable plays as he is known for being aggressive. On offense the Warriors need to find mismatches for Durant and never let the Cavs find a defensive rhythm. The Cavs need to contain Curry and Thompson and keep them from getting into a rhythm. If either gets hot and starts hitting consecutive threes, the game can get out of reach very fast. They also need to keep Durant in check. The Cavs defense is the big question here and they’re going to need make this series slow, scrappy and ugly if they want a chance at winning. Their guards have to step up defensively since Durant creates so many mismatches when he’s got the ball in isolation, we’ll see a lot of in crunch time when the game slows down. Offensively they need to limit turnovers and get Kevin Love going. Mid season addition Deron Williams will need to play smart and can’t be a defensive liability during his minutes. Defense is key for both teams but at the same time they’ve got to be able to score during crunch time. They need to perform under duress and figure out a way to get buckets when it counts. Kyrie’s game winning shot and Lebron’s game saving block in 2016 are two notable plays that stand out and the winning team will need to have some of these defining and momentum shifting plays. This is yet another chance for Lebron to continue growing his legacy. Defensively the Warriors had a better season and offensively they have more weapons but still, there’s something special about this Cavs team and the way Lebron’s been playing this year. He’s a man among boys and expect him to put up monster minutes and numbers as usual. He and the rest of the Cavs have been playing like they’ve got nothing to lose and that’s scary for the Warriors. Additionally, Warriors coach Steve Kerr continues to struggle with his health and that could have an adverse affect on the team. Hopefully coach Kerr is healthy enough to be courtside and gets the help he needs this off season, back injuries are no fun. The Warriors are heavily favored by the bookies and the Cavs are getting little respect from the majority of TV personalities. Sure, Durant is a huge addition to an already strong Warriors team and on paper they’re the stronger team. I just want to know, where’s the respect for the defending champion Cavaliers? I’m throwing out the stat sheets and picking Cleveland in six games. The first thing I noticed when walking into La Moustache Blanche was the endless stacks of beer filling every possible space. The second thing I noticed was the smooth jazz being played off of Guillaume's vintage record player. This place, located next to Place de Bastille, spews good vibes and welcomes all who like beer and gastronomy. The owner, Guillaume, poses with a tasty beverage. Having opened in November 2012 when there were less than a half dozen craft beer shops in Paris, La Moustache Blanche had to adapt and create the local scene. Since Guillaume was one of the earliest adopters of Parisian craft beer culture, he built his shop to fit the local interests which had a “demand for quality”. Rather than trying to shape the French beer culture to fit the mold of other countries like England or the US, he morphed his shops identity to be complimentary to Parisian culture. Guillaume even compared French beer and wine culture because he’s often tasked with matching flavors and foods. With the importance of gastronomy in France, Guillaume incorporates a balance of beers to match with any food or snack. He describes his selection as “all types, profiles and prices, perfect for experts and amateurs alike”. His family background in restaurants works in his favor when it comes to describing terms in a way that French people can understand. In a sense he's managed to change the purpose of micro brews to fit the wants of Parisians, who have a very strong food culture. La Moustache Blanche has an impressive selection of beers. While Guillaume's a huge beer enthusiast and clearly knowledgeable of beer culture, he remains very approachable and isn’t a snob. One of his favorite parts of running La Moustache Blanche is that he has the unique chance to grow and teach beer culture to Paris. He embraces the opportunity to teach less knowledgeable customers about beer and describes his store as “a spot for surprise and curiosity”. At the same time, La Moustache Blanche isn’t just frequented by local Parisians learning about beer culture. Because Paris is one of the most touristic cities in the world, Guillaume is regularly asked to show off local breweries. He says “there’s a growing demand for local craft beers from tourists”. Their best selling local beer is from Les Brasseurs du Grand Paris but there are many more local breweries. Currently, some of his favorite local beers are from O’clock Brewing because they’ve managed to create a huge selection despite only a year of brewing. For those who want to try something from far away, look no further. I saw beers from all over the world, although this selection is less consistent than the local beers because it’s not always easy to get beers from abroad. Regardless, should you want a good international beer; La Moustache Blanche is the place to go. There’s no shortage of English, Italian, American and of course Belgian beers, among others. If you find yourself in Paris looking for some quality craft beers, be sure to stop by La Moustache Blanche and say “what’s up” to Guillaume. If you’re lucky you may get some funny stories about customers walking in looking for a case of bud light and some olive oil, otherwise you’re guaranteed to walk out with some quality beer and a smile. For more information about La Moustache Blanche check out their website HERE. The San Antonio Spurs and Golden State Warriors are set to face off in the Western Conference finals. It's sure to be a thrilling matchup and should push the Warriors more than their two previous matchups. Gauging the series is tricky; the teams played only one game at full force after controversially resting starters in two of their three regular season meetings. The spurs ended up taking the series two out of three, they also won the only game played with complete rosters. It should be noted, their full force game was the season opener and Durant’s first official game as a Warrior. At the same time, it was played at Golden State and the Spurs blew out the Warriors 129-100. Today, the Warriors are the clear favorites as they have home court advantage and the team is stacked with talent. The Spurs have the same quality of depth but took a hit when Tony Parker picked up an injury against the rockets. I still don’t think that Tony Parker’s injury is as big of a deal as people make it out to be, he's been in decline the past couple years. For the Spurs, Patty Mills and Jonathan Simmons will be the keys to success. They'll have to control Golden State’s splash brothers. If Kawhi Leonard continues to be his usual self and the Spurs guards are able to step up in Parker’s absence, then San Antonio have a good chance. It’s unlikely that San Antonio wins the first game but this will be a long series, Coach Popovich knows how to get the most out of his players. Expect to see a smaller lineup from the Spurs where Pau Gasol and LaMarcus Aldridge don’t share the court often, it will also be interesting to see how Popovich uses David Lee, a former Warrior. The Spurs will need to slow the pace of play, forcing half court basketball if they want to have a chance. The Warriors don’t have quite as deep of a bench as the Spurs but they make up for that with star power. If Klay Thompson or Stephen Curry get hot hand they are nearly unbeatable. Durant needs to continue his defensive dominance and be a consistent scorer in isolation. Draymond Green will need to battle the taller Spurs forwards and centers, it will be interesting to see how he handles LaMarcus Aldridge is isolation. On paper the Warriors are one of the greatest teams in history just based on their roster and have a clear advantage in talent. They need to keep the pace fast and never let the Spurs defense get comfortable. The series could be one for the ages and hopefully it doesn’t disappoint. Golden State is the popular pick but they'll have their hands full with the deep and talented Spurs who compete to the end. Expect for Popovich and Kerr to get the most out of their players. If Donald Trump’s campaign were to have guaranteed anything, it should have been entertaining journalism and great comedy. He's been the target of endless jokes and ridiculous accusations and has really earned it. So far his presidency has felt like a soap opera, except the story is so ridiculous it couldn’t possibly be true. Who needs House of Cards when we’ve got Trump? The firing of James Comey is the most recent episode in the ongoing saga that is the white house. It’s a move that even left Trump supporters perplexed and suspicious because the timing. It happened just after Comey requested additional resources to investigate Russian interference during the election, specifically from the Trump campaign. This has many people are bothered. Trump seems more out of touch than ever and that’s gotten the public especially curious. Under the temporary control of Andrew McCabe, the FBI has stated their intent to continue their investigation into Trump’s relation to Russia. A statement by the white house revealed that Comey was fired for the investigation involving Hillary Clinton’s campaign ties to Russia, which happened during the elections. This is especially weird because only months ago Trump was praising Comey for the same investigation, ironically democrats were calling for his resignation. While this makes for a great soap opera, we still don’t know the long term consequences to Comey’s dismissal. As of now, it looks like the FBI investigation is just beginning to ramp up and this added fuel to the fire. In the more distant future there could be other consequences, even if nothing’s found. Trump managed to beat a controversial candidate during the 2016 elections but with all this bad press, he may not be so fortunate in 2020. How do you explain the greatness of baseball? In truth you can’t. Between the 150 years of statistics and the constant bizarre situations that show up daily, each person gets something different out of the game. Baseball is a grind, the games can last anywhere from two to six hours and sometimes more. What’s even crazier is that excluding the playoffs there are 162 games. So for six months baseball players play a game roughly every other day that average about three hours. By the time playoffs arrive; most teams have already known whether or not they would advance for months, the few that are still alive battle to the end. Due to the sheer number of games, there’s action every day. Some days there are fights because a pitcher intentionally threw at a batter, other days there’s an obscure statistic being pulled out of the woodworks because a player achieved some new feat. Baseball is a diverse game and has many different appeals depending on the person who follows it. Many fans enjoy analyzing the 150 years of statistics while others have different reasons. A friend of mine loves baseball because “no matter what is happening during the game there is always time to get a beer”. It’s a game that’s long and grueling in nature and that’s part of the appeal. The game dates back to the civil war, the National League started in 1876 and the MLB as we know it started in 1903. It’s a historic game that runs in the blood of America but the US isn’t the only country playing, 28% of the opening day rosters in 2017 were foreign born. It feels like that number goes up every year. There are so many different types of fans out there. Some people enjoy going to games but not watching them on TV while many people are the opposite. Some people follow the stats and get very analytical but others throw them out the window in favor watching individual swings and pitching motions. There really is no right or wrong way to follow baseball and that’s what makes it such a great game. They NBA playoffs are a fun time. We get to see some of the most freakishly large and athletic human beings in the world compete at the highest level as though their lives depend on it. While it’s fun to cheer on your team, every year it gets a bit harder knowing that your team doesn’t stand a chance against the top dogs. I may be speaking too soon but it already looks like we’re destined to see a third consecutive Cavaliers and Warriors final, of course we’re only at the conference semi finals and anything can happen. Dating back to the Kevin Durant signing, I can’t even count the amount of times I’ve been asked who will win the finals “between Golden State and Cleveland”. Bear in mind this was months before the season even started and even before the preseason. Yet here we are, in the middle of the playoffs gearing up to witness the inevitable. Lebron and his Cleveland Cavaliers are yet to lose a playoff game. Despite the fact that Cleveland only won in a four game sweep by a combined total of 16 points, Indiana never stood a chance. In the first two games, Cleveland beat Toronto by a combined 33 points, meaning Toronto isn’t doing much better. The winner of this series will face either the Boston Celtics or Washington Wizards, which is shaping up to be quite an intense series. In the Western conference we are seeing a similar trend as Golden state has also won the first two in their series against Utah, although like Cleveland they played both games at home and will now play two on the road. Golden state will have a tough series ahead if they advance to face Houston or San Antonio, but the depth and talent of their team puts them in a good position to win. The one major concern that I have with Golden State is the absence of their coach Steve Kerr, who’s been battling complications from spinal surgery. Still, last year when Steve Kerr missed the start of the season they nearly broke the record for consecutive games won. While I admit that it’s frustrating to see these same teams dominate year in and year out, the reality is I’m only frustrated that my Lakers aren’t the team that’s dominating. Historically basketball has been a game controlled by dynasties which are tied to the legacies of individual players. For example, we see this with teams dating back to the days of Bill Russell and the Celtics, who won 11 championships together and then later Michael Jordan and the Bulls who won six championships. These dynasties are a part of basketball culture and they aren’t going anywhere. It’s not a bad thing to have a team like the Cleveland Cavaliers build their dynasty; in fact I would argue that it’s completely normal and pretty awesome. The Cavaliers were a middle of the pack team throughout NBA history, one day Lebron James showed up and he has transformed the entire franchise. Dynasties in basketball are tied to players just as much as Franchises. With only five players on a court at a time, there’s a lot more emphasis on individual talent than other sports like football for example. While it’s important to have a deep bench and roll players, it still comes down to the quality of the stars. Sure, this year’s playoffs may feel a bit predictable, especially in the east but instead of complaining about it we should be embracing the greatness. Basketball has and will always be dominated by the teams with the most talent and the best players or player. Of course the coaches, owners and general managers still need to be given credit for building their teams and putting them in a position to win. As fans all we can do is root for our team and hope that greatness swings their way. The French elections are full throttle and have massive repercussions regarding the future of the European Union. Marine Le Pen and Emmanuel Macron are the two final candidates out of an original 11. Meanwhile, Europe and the rest of the world sit idle, anxiously awaiting a winner. As an American regularly communicating with French voters, I constantly hear the same comparisons between this election to last years in the United States. Sitting at one side is Le Pen, a nationalist looking to inspire the French economy by supporting localized manufacturing and severing international ties, like the EU. She is a polarizing figure that has garnered a lot of attention due to her political parties past, (National Front) which is filled with bigotry. In addition, she has had an ongoing legal battle with the European Union which has no end in sight. This reputation has lead to many comparisons with Trump, who also had his share of controversy. On the other end is Macron, a moderate candidate who doesn’t have the polarizing legacy of Le Pen but does have other assets. He founded his political party, En Marche!, and has garnered quite a bit of public support. At face value, he doesn’t have any obvious flaws or more importantly scandals and he feels like a generic candidate without any special vices or virtues. This has worked to his advantage because the media has painted him out as their golden boy, even as far back as during the primaries. People like to compare Le Pen to Trump but there are a couple bits of information that are regularly overlooked, especially by the American media. Le Pen has been a lifelong civil servant while Trump never served in public office prior to being president. Trump's political life is more like Macron's, who has limited experience in public office compared to Le Pen, but has a background in investment banking and economics. In short, Trumps background is similar to Macron's, but his social policies are more like Le Pen's. At the same time, Trump and Le Pen's campaigns do share one major characteristic. They both gained popularity through controversy and their nationalistic ideologies. Whether or not the candidates are racists or bigots (or whatever other words people like to use) is up for debate, but it can't be denied that their campaigns have been tied with racism and bigotry from the start. Most of the time when people compare their two campaigns, they aren't comparing the political backgrounds so much as what they represent socially. In the US, people were upset with Trumps victory because of the social connotations. They felt like Trumps win represented a cultural regression. In France many people feel the same way towards Le Pen, people even go so far as saying she's more extreme than Trump. In reality while people are upset with the candidates, they are even more disappointed in their countries, which voted these candidates to power. Like Trump, Le Pen has taken advantage of the nationalism sweeping the world. We will know whether or not her tactics work on the 5th, but for now it's time to sit back and watch how the elections unfold.